It doesn't take long before you start tracing everything back to the influence of The Zombies. 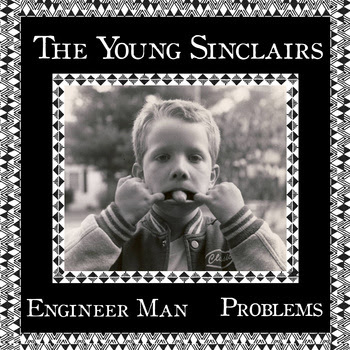 I'm especially thinking about them listening to this latest single from The Young Sinclairs on Market Square Recordings. The Zombies, from England, seemed to do better in the US then they did at home and this single from The Young Sinclairs is at least the second overseas label to be releasing their stuff in what might be restitution for overlooking a crazy amount of great singles from that under-appreciated band. "Engineer Man" opens with a slight acoustic high line jangle for the lush '60s psych to pour on, especially the vocals which are a pitch perfect snapshot of that era. Like Tim Cohen taken to an almost absurd extreme place of bubbling layered psych. In the light jangle, everything slightly obscured and smoothed over with perfect production, there's a hint of early REM, especially "Oddfellows local 151", but mostly you you have an impressive mix, a real labored, put together pinnacle of pop psych. The fact they can continuously be getting down this high quality, complex hazy sparkle is impressive in itself. Honestly everything I've heard from these guys is pretty mindblowing in the same way The Fresh and Onlys are. The Young Sinclairs might be taking things back and sticking more closely to the original source, but their attention to the details is undeniable. B-Side's "Problems" is more of that perfectly crafted high production sound, in these guitar sounds, the light beats of percussion, heavily creates this kind of Panda Bear-esque wash of a groove to settle in like a fog and get lost for a few minutes. More like that ork-pop sound of Pet Sounds this is a dense arrangement of interlocking pop which could stand alongside recent Kurt Heasley Lilys output. The feathery light echo on the main and backup vocal is about as optimistic and sunny sounding as you could jam onto a tiny record - both sides are fantastic, an example of another great single and their magic from another era entirely. You can pick this up from Market Square Recordings direct or try 13 o'clock or Get Hip distro's in the US. Thansk to Requiem Pour Un Twister I have a couple of copies of their single on that label to distro here in the US. Check them out over here.